My vacation should be wrapping up pretty soon. I could be sitting at a sidewalk cafe in Quebec City and sipping on some red wine or trying some french fries cooked in duck fat in Montreal. This meal isn’t as exciting as whatever it is I could be doing, but then again, I could be stuck in traffic, which would make this meal glamorous and exciting in comparison. That’s not saying that this meal was a let-down. In fact, it was quite the opposite. I like to think of this as a deconstructed burrito inspired by my favorite burrito at a local vegan Mexican restaurant. With roasted pineapple, fresh salsa and black beans, you can’t go wrong. It’s delicious, filling and I can see this meal becoming a habit. It may look like there are a lot of steps involved here, but it’s quite simple to put together. Then again, I love chopping and general prep work, so turn on your favorite summer jams and get this meal started. 1. Prepare rice as usual. Everyone has their tricks for making great rice, so make it your way. 2. Create a quick salsa, by combining the tomatoes, onion, lime juice & zest, cilantro and spices. Set aside. 3. Roast pineapple over a grill or under the broiler in your oven until in gets charred in places. Flip, roast and dice. Set aside. 4. In a large pan, heat oil and add in garlic, onion, and red pepper. Saute until it gets soft, add in spices and black beans. Heat through. 5. Layer all ingredients into a bowl. 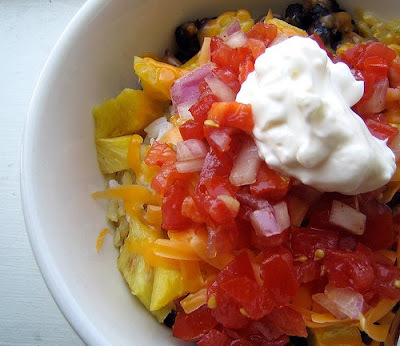 Rice on the bottom, then black beans, pineapple, salsa and then top with a sprinkle of cheese, a spoonful of sour cream and a sprinkle or more of your favorite hot sauce. I think this looks perfectly glamorous! But then, I'm not on vacation. Hope you're having fun! Mmm! It's hard not to go wrong with pineapple AND cheese. As a fan of fruity salsa, this recipe is a major temptation. Happy vacation to you! Glamorous or not, it sounds delicious! Hope you're out having fun! This sounds very good! It's very pretty too. i love the unexpected pineapple in this. i've never roasted pineapple, but i bet the sugar carmelizes it so perfectly. i can't wait to try this. Barbeque season is coming to an end but before I put away the BBQ for good, I just have to grill some pineapple and toss it into a Mexican bowl just like yours. This looks so delicious! Oh my goodness, this looks really good. Who cares if it's not fancy-looking! 🙂 I just started reading your blog, and I've enjoyed every single entry! I have my own blog too, mostly about baking and cooking: http://www.thedailyv.com. I can't wait to read more of your entries! Thanks Adrienne! I don't know about glamorous, but it is delicious. Miss Kate, I agree completely! Stephchows, it was a wonderful vacation and it's good to be back. Now, I've got to start cooking again! It does, Jilly. Roasted pineapple is amazing and it's perfect in this. Thanks Kristilyn. All my posts were written pre-holiday, but I can attest to the awesomeness of the vacation. Yes, indeedy. Thanks for stopping by Vanessa! I'll definitely take a peek at your blog. Thanks! I have never roasted pineapple but I just know it would be amazing. This is a perfect dinner for me. I actually prefer the burrito without the tortilla – I just like the yummy stuff inside. Welcome home from your trip! I was very inspired by this recipe. I made a variation on this bowl, using whole wheat cous cous…I'm too hungry to wait for rice! I also added lots of fresh lime juice and used some romaine lettuce (shredded) and avocado instead of the pineapple. I don't have a grill and again too hungry/lazy to wait for grilled pineapple… but I bet it is delicious, especially with a lot of spice! Yum! i love pineaple, and this looks amazing! well done, and have fun! Thanks Dana, and yes, roasted pineapple is amazing! Jeff, I totally remember you! I'll email you soon. Hag, your variations sound perfect. I'm hungry now.